For prior parts, click here. I didn’t have the greatest angle, and another player got in the way of what would have been my best shot, but here is a video from another angle that is going viral via Sportscenter. SOU shutout the Saints today, their first shutout in 15 years. That 27-0 win, coupled with Eastern Oregon University’s win over Montana Western, puts 4-0 Southern Oregon into sole possession of first place in the Frontier Conference. Montana Western and Montana Tech share second place with 3-1 records. The Raiders have a bye week next week followed by another away game in Montana on October 6. That game will be against Rocky Mountain, who barely got by College of Idaho today. Posted on September 3rd, 2018 under only in ashland, people. Tags: Bronsen Ader, football, Nikon 70-200mm f/2.8G VR II, Nikon D500, Raider Athletics, sports photography. Comments Off on Happy birthday, Bronsen Ader! Before attempting to answer that question, I decided to go back over the NAIA football playoffs of the past five years to see which conferences the coaches have erroneously favored the most (by giving undeserved home games) and which they have punished the most (by putting them on the road against inferior opponents). I went through every playoff game from 2012 to 2016 but ignored the championship games since those were away games for both teams. The Frontier Conference is by far the coaches most unfairly ranked conference. No Frontier Conference team has lost a home playoff game to a non-Frontier Conference team in the past five years. 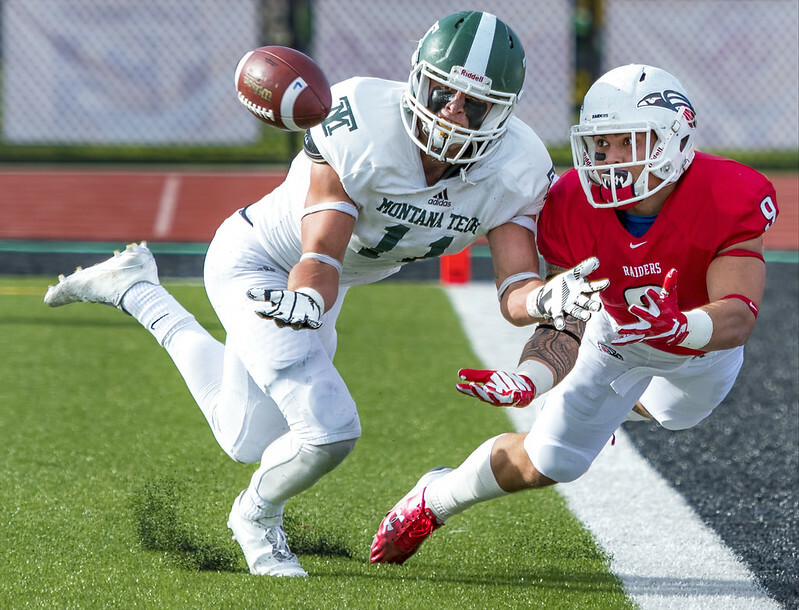 Seven times in the past five years, Frontier Conference teams have won road playoff games against non-Frontier Conference teams. No other conference can come close to this track record. Most conferences are +1, 0, or -1 in this analysis, and therefore aren’t worth mentioning. However, one conference is -6. The Heart of America Conference has won zero playoff games on the road during the past five years. Heart of America Conference teams have lost six playoff games at home during the past five years. The conclusion is pretty clear. The coaches are ranking Heart of America Conference teams too high and Frontier Conference teams too low. Will they continue to do so tomorrow? If the coaches are at all fair (and less evil than they have been in the past), SOU will move up to #5, with Grand View coming in at #6, and Baker coming in no higher than #7. The odds are decent for this, but probably not more than 50%. The Raiders could end up at #6. If the coaches are truly evil then the 9-0 Raiders will remain at #7, with two Heart of America Conference teams with loses ahead of them in the rankings. …the deck is, and has been, stacked against the Frontier Conference in favor of the Heart of America Conference (and Mid-South Conference). Massey Ratings has SOU as a 4-point favorite in today’s game at College of Idaho. Posted on September 9th, 2017 under people. Tags: Bronsen Ader, football, Jason Shelley, Nikon 70-200mm f/2.8G VR II, Nikon D500, Raider Athletics, sports photography. Comments Off on Gameday! Posted on February 17th, 2017 under only in ashland, people. Tags: Bronsen Ader, football, isiah carter, Raider Athletics, sports photography. Comments Off on Happy birthday, Isiah Carter! With the Raiders big road win yesterday in Montana, Massey has bumped Southern Oregon up in the computer rankings to #3. SOU will play Massey’s #12, #11, and #9 over the next three weeks. Two of those games are at home in Ashland. Massey has the Raiders as at least 7 point favorites in each contest. The coaches’ poll comes out tomorrow. Don’t look for any major changes in the top nine from the coaches. The coaches don’t tend to move teams up unless the team in front of them lost. It will be interesting to see what they do with #2 Morningside. The Raiders were punished in the poll for losing to NCAA DI UC Davis, even though the Raiders accumulated more yards than Davis. Yesterday Morningside lost to an NCAA DIII team (Wisconsin-Whitewater) by two touchdowns. Massey says that UC Davis could beat Wisconsin-Whitewater by a touchdown. Will the coaches drop Morningside as much as they dropped the Raiders? I doubt it. Look for Morningside to slip barely out of the top five and the Raiders to still be at #9. It’s way too early for these rankings to mean anything, but the NAIA coaches have SOU at #2 in the country, and Massey has them at #3. Massey Ratings, as shown above, also has SOU winning all of their regular season games against NAIA opponents. At Eastern Oregon, for the very first game, is a tough draw. If SOU can start the season 3-1 or 4-0, then these preseason predictions are probably correct. Go Raiders!